1980 - Michael attends the 7th Annual American Music Awards, at the ABC-TV Studios in Hollywood, Ca. Michael receives 3 awards for Off The Wall and presents an award to the Bee Gees. Dressed in his trademark tux with a sequined shirt, Michael took home the awards for Favorite Soul/R&B Male Artist, Favorite Soul/R&B Album for Off The Wall, and Favorite Soul/R&B Single for Don't Stop 'Til You Get Enough. 1993 - Michael performs "We Are The World" with celebrities at the Pre-Inaugural Celebration for Bill Clinton held at the Lincoln Memorial in Washington, DC. The day before the Inaugural Gala, Michael made an unscheduled appearance on pre-Inaugural celebration. 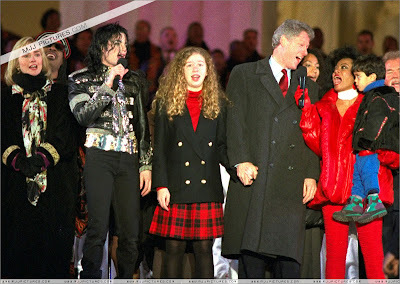 He joined Diana Ross and several other celebrities on the steps of the Lincoln Memorial in a performance of We Are The World, standing, dressed in black and gold, next to President elect Clinton, the soon to be new First Lady, and their daughter Chelsea. 1996 - Lisa Marie Presley-Jackson filed for divorce from Michael, ending a 19-month marriage that merged pop royalty. A statement from Jackson spokesman Lee Solters said the two "have mutually agreed to go their separate ways. However, they remain good friends." Irreconcilable differences were given as reason. Michael got married to Lisa on May 26, 1994 in the Dominican Republic. 1998 - Michael wins the copyright infringement case against Al Bano Carrisi for the song Will You Be There. 2008 - 'The Girl Is Mine 2008' - the first single from the upcoming 'Thriller 25th Anniversary Edition' - has released to radio stations worldwide. This entry was posted on 18 January 2011 at Tuesday, January 18, 2011 and is filed under 1980, 1989, 1993, 1996, 1998, 2008 . You can follow any responses to this entry through the comments feed .